We’d love your help. Let us know what’s wrong with this preview of Ghost of a Feeling by Celestine Trinidad. All Cris Villareal had ever dreamed of was becoming a doctor. But after the death of a patient under her care and the subsequent humiliation she suffers under a senior resident in her hospital, she begins to lose faith in herself. And no one else could understand her and her despair. So one Halloween night, up on the rooftop of her apartment building, she decides to end it All Cris Villareal had ever dreamed of was becoming a doctor. But after the death of a patient under her care and the subsequent humiliation she suffers under a senior resident in her hospital, she begins to lose faith in herself. And no one else could understand her and her despair. So one Halloween night, up on the rooftop of her apartment building, she decides to end it all. She is stopped from jumping by Emilio, the ghost of a young man who haunts her building, who also committed suicide there many years ago. Eventually, Cris finds herself opening up to him, in a way she had never before, with anyone living or dead. Emilio isn’t really a ghost. He is actually a living young man named Nathan Morales, and Cris was just one of the unwitting victims in a prank he had once played on the tenants of her apartment. But being Emilio was the only way he could think of to stop her that night, and the only way now he could get her to open up to him. As Emilio, he was someone she could trust enough to help her, in a way Nathan himself never could. As their relationship grows deeper and their feelings grow stronger each day, can he finally help her find a reason to keep living? To ask other readers questions about Ghost of a Feeling, please sign up. Is this the same as "Last Night", starring Piolo and Toni? HIGHLY, STRONGLY, PROUDLY RECOMMENDED. Going to my all-time favorites list! I can’t think of anything of similar themes I’ve read before that compares to how well plotted and perfectly paced this book is. There’s no unnecessary scene or character, and every feeling has a reason for existing on the page. The quips and the emotional pulls are rooted in things that people can relate to with ease. The character development is strong and the storytelling smooth, making it hard to put down. Read the re HIGHLY, STRONGLY, PROUDLY RECOMMENDED. Going to my all-time favorites list! I have no idea how to voice out my thoughts on this it truly was hauntingly beautiful. *ARC in exchange for an honest review. Ghost of a Feeling is the first medical romance I have ever read, and I have to say that I’m so glad it was my first. The author not only told a believable and highly engaging story set in the world of surgeries and emergency rooms, but she was also able to hook me in right from the beginning with the gripping tragedy that tugs at the heartstrings at the start. It’s not always easy to mix tragic elements with lovey-dovey ones, but with GOAF, it was seamlessl *ARC in exchange for an honest review. Ghost of a Feeling is the first medical romance I have ever read, and I have to say that I’m so glad it was my first. The author not only told a believable and highly engaging story set in the world of surgeries and emergency rooms, but she was also able to hook me in right from the beginning with the gripping tragedy that tugs at the heartstrings at the start. It’s not always easy to mix tragic elements with lovey-dovey ones, but with GOAF, it was seamlessly done. Cris is a strong protagonist that can easily be a female role model. She’s smart and sophisticated and sensitive and all-around awesome, but she’s also not afraid to give in to her weaknesses and her vulnerabilities. Nathan is equally as delightful, and the whole pretending to be a ghost thing was so quirky and delish that I just couldn’t bear to see what happens next when the whole prank is revealed. My second book about mental health in a row! It deals with a heavy subject (depression, suicide) and it keeps it real, but still manages to be light and funny at parts, which was very refreshing. I loved Nathan/Emilio! He really knew the right things to say and was very sweet, I wanna get me a man like that. I do think the ending could have been better, though. I think it came to soon, maybe it could have used an epilogue to wrap everything up, because, as it My second book about mental health in a row! I still loved the book, though! Very original idea with a good execution, amazing characters and a great message! "I do not want to say that it will be all right in the end. I cannot know that. Things might even get worse from here, and you may never be as happy as you hope. But if you do decide to end it now, there really will be no chance of you ever being happy again." More often than not, romances are about sparks flying, and heat sizzling as fingers touch, and exploding feelings of giddiness. But what Cris and Nathan had wasn’t all fire and noise; but rather, a quiet, steady romance that held promises of being there for each other no matter what, which I found to be really beautiful. Their chemistry did not rely on insanely fiery attraction; instead, it banked on their mutual empathy and trust. It genuinely baffles me how Celestine Trinidad was able to explor More often than not, romances are about sparks flying, and heat sizzling as fingers touch, and exploding feelings of giddiness. But what Cris and Nathan had wasn’t all fire and noise; but rather, a quiet, steady romance that held promises of being there for each other no matter what, which I found to be really beautiful. Their chemistry did not rely on insanely fiery attraction; instead, it banked on their mutual empathy and trust. It genuinely baffles me how Celestine Trinidad was able to explore sensitive topics and themes with painful accuracy, thorough research, and thought-provoking depth within a limited handful of pages. 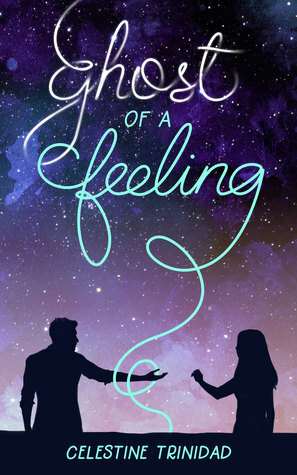 For a relatively short novel, Ghost of a Feeling offered so many wonderfully positive messages, as well as a lot of thoughtful insight on the harsh reality of mental health struggles and the repercussions of denying people the help and support that they need. One of my favorite takeaways from this novel is that we should never undermine or invalidate someone else’s struggle! The story also featured quite a handful of medical jargon that was presented in a way that was never overwhelming or intimidating. With all that said, it’s an understatement to say that I really, really enjoyed reading this novel. More than just a well-written medical romance, the story Celestine Trinidad tells in Ghost of a Feeling is no-holds-barred honest, carefully constructed, and consistently heart-wrenching. Note: I received a digital Advanced Reader’s Copy (ARC) of Ghost of a Feeling from the author herself in exchange for an honest review. Many thanks to Celestine Trinidad for the opportunity! With the increase of suicide cases due to depression, Ghost of a Feeling is a timely, must-read story filled with hope to help spread and increase awareness on mental illness. Kudos to Celestine Trinidad for this masterpiece. Ghost of a Feeling by Celestine Trinidad is a strong romanceclass debut novel. It starts off with a meet cute of sorts (meet sad? ): the heroine is a medical student who loses a patient during her junior internship. She's subsequently humiliated by the resident in charge, and becomes overwhelmed with everything. She hits rock bottom and decides to end it all, she's stopped by what she thinks is her building's resident ghost but is actually the hero in costume for Halloween. Thus begins an unlikely friendship that blossoms into something more. A slow burn romance that was handled with the sensitivity needed for the heavy themes depicted in this book. I was equally curious and worried about how this story will unfold, given its unusual premise. But there was no need to worry because Cris and Nathan were in good hands, and I gladly let myself be swept away by their story. For such a short book, the characters had real depth with both of them learning to deal with their own baggage, and trying their best to move on. It was interesting to get a closer look at the difficulties of becoming a doctor in the Philippines. I've heard stories from friends who eventually became doctors, but I guess it's different when you get to experience it through the eyes of a fictional character. Brings it somewhat closer to home. One thing I enjoyed was how present Cris and Nathan's family and friends are in their lives, it wasn't just their budding romance that was a significant relationship for each of them. I very much enjoyed this book! The scenes between Emilio (the ghost) and Cris (the doctor) were full of friendship, openness/innocence and of growing affection between the two protagonists. To me, the narrative especially shines during the medical scenes/dialogue (of course, Author Celestine is a Doctor, too! ), yet what is very good there in my opinion is that despite the very taxing nature of medical work including all its rigorous details, its rigid structures and procedures, its heavy dramas I very much enjoyed this book! The scenes between Emilio (the ghost) and Cris (the doctor) were full of friendship, openness/innocence and of growing affection between the two protagonists. To me, the narrative especially shines during the medical scenes/dialogue (of course, Author Celestine is a Doctor, too! ), yet what is very good there in my opinion is that despite the very taxing nature of medical work including all its rigorous details, its rigid structures and procedures, its heavy dramas and emotional/mental traumas, Author-Doctor Celestine manages to balance this with the lightness, the deepening friendship, the growing love between both protagonists, keeping us readers SAFE that indeed this is a LOVE STORY. A metaphor is that your airplane is lurching in high-altitude turbulence (medical stuff with heavy-drama/trauma), but you KNOW you are SAFE (this is about a man and woman falling in love). This story keeps us safe; it never outbalances nor swamps out its overall arc that this is indeed a romance novel. Likewise, we see in this story that doctors ARE indeed real people, with real feelings, real vulnerabilities, real struggles. They get heartbroken, just like us. They have dreams. Their dreams also get shattered. They have HEART (and if we’re lucky [as their patients], they have A LOT OF HEART). But their hearts also get shattered (sometimes in VERY dramatic fashion). They get sick, hurt, wounded---and they also HEAL, just like us---especially when they have the help of heart-guided doctors/healers (as the female protagonist Dr. Cris had her healer/doctor/ghost). It all comes out in this story. Lastly, in my opinion, the writing is always very sincere, very honest. It is never pretentious or condescending. It is, to me, always focused and true to its core of being a love story. This book is for anyone who finds themselves lost right now, that are hurt, afraid, or confused about anything in their life. Ghost of a Feeling filled me up with a lot of hope and I think everyone should read it. "I'm just so tired of it all. I'm not as strong as everyone needs me to be. I'm not okay. But I can't not be okay. It's stupid and weak. I hate myself for being so weak." Let me tell you about my girl, Cris. She's such a relatable character, despite me not being in the field of medicin This book is for anyone who finds themselves lost right now, that are hurt, afraid, or confused about anything in their life. Ghost of a Feeling filled me up with a lot of hope and I think everyone should read it. Let me tell you about my girl, Cris. She's such a relatable character, despite me not being in the field of medicine like herself, because she's hit rock bottom and is dealing with depression. The representation in this book through her character is phenomenal - I felt her pain because it was so alike to what I've felt. It was both beautiful and heartbreaking to read at times, but comforting at the same time. She's so empty but. . . she gets through it. "You can be sad. You can cry. And it is perfectly all right." I can't express in enough words how much I enjoyed this book and loved it. I truly enjoyed reading it. The medical jargons, the in-depth description of what is really happening in a hospital and the experience itself of an actual doctor is really well written. Me, being a big fan of medical tv dramas, being able to read something like this is much more fullfiling for me (next to my favorite book the Outlander series by Diana Gabaldon). I would like to read more medical based theme books in the future. The book is really easy to read and had the perfect length for its st I truly enjoyed reading it. The medical jargons, the in-depth description of what is really happening in a hospital and the experience itself of an actual doctor is really well written. Me, being a big fan of medical tv dramas, being able to read something like this is much more fullfiling for me (next to my favorite book the Outlander series by Diana Gabaldon). I would like to read more medical based theme books in the future. Kicking off my 2018 reading challenge with yet another #romanceclass book. (What can I say, I'm hooked! Haha.) And by the looks of things, it's off to a great start. The story begins with Cris, a medical student who was about to commit suicide when a patient of hers died under her care and she was humiliated by her superior which caused her to second-guess herself and her dream of becoming a doctor. Enter Emilio, someone she thought was a ghost (but is actually a living, breathing human named Nathan) who talks her out of it and from there became somewhat confidantes. Cris was lucky that someone like Nathan/Emilio managed to stop her before it was too late. Unfortunately, not many are as lucky as her. That's why it is important to push for awareness on mental health and get people informed on where to get help. It's not easy to talk about it though, since it is a very delicate topic but the author handled it with such grace and sincerity. Honestly, she should pat herself on the back for a beautiful and well executed story. It didn't feel like I was reading fiction because it felt all too real, especially with Cris who I deem extremely relatable and distinctly human. I'd like to commend Nathan too, as a character because despite his own personal troubles, he was really selfless and helped Cris on her path to self-healing. I loved that the other side characters were also very supportive of Cris and her struggles. The bit about Cris' mom coming with her to Dr. Lim, her therapist, may seem inconsequential to some but honestly, it shows how willing her mom was to understand. And sometimes, that's what people need: to understand, to listen, to support. "You think that sadness is all there is for you now. . . And I do not want to say that it will be all right in the end. I cannot know that. No one can. . . But I am sure of one thing: if you do decide to end it now, there really will be no chance of you ever being happy again." I don't know how to begin this review except to say that I related to Cris on several levels, the severity of which I wouldn't elaborate further, LOL. Let's just say there were some p dark and difficult times I never want "You think that sadness is all there is for you now. . . And I do not want to say that it will be all right in the end. I cannot know that. No one can. . . But I am sure of one thing: if you do decide to end it now, there really will be no chance of you ever being happy again." I don't know how to begin this review except to say that I related to Cris on several levels, the severity of which I wouldn't elaborate further, LOL. Let's just say there were some p dark and difficult times I never want to experience again. And reading through this made me remember, but I guess it also made me realize how far I've gone, thanks to A LOT of wonderful people, whether they know it or not. Mental health is a tricky subject to begin with, but this book approaches it with compassion and kindness. It doesn't sugar coat the hard parts, and I appreciate that, bec we need more stories that tell it as it is. "Maybe it's all those years carrying the weight of my sorrows,..."
That quote above is from one of the many parts where the tone is light and funny. I was concerned about the whole Emilio/Nathan 'deception' especially when Cris found out the truth, but, again, the layered characterization helped make sense and sensitive to Cris. "It's not really what happened that made me happy. It was remembering the hope." Again, this romance dealt with serious, dark stuff, but it didn't just leave it at that. It went further and offered light. The bright, explosive kind of light that electrifies a night sky. As well as the subtle kind that comes from a happy, hopeful feeling that stays within you, and blossoms to drive away the bad things. I really loved this book and highly recommend this to everyone! Reading Cris’ story felt very much like steadily climbing a steep, rocky hill, reaching the top, then merrily sliding down, coming to a grassy, peaceful pasture. The book was beautifully woven with a seamless plot and perfectly, realistically intertwined characters. Chapter by chapter, the pieces of the puzzle were made to rightfully fall snugly to their proper place to form a beautiful tapestry of relatable human emotions and the tr I really loved this book and highly recommend this to everyone! The book was beautifully woven with a seamless plot and perfectly, realistically intertwined characters. Chapter by chapter, the pieces of the puzzle were made to rightfully fall snugly to their proper place to form a beautiful tapestry of relatable human emotions and the triumph of human courage. I love Nathan. He is the perfect guy, the long-suffering lovestruck martyr whom fate (with a stroke of ingenuity and a strange sense of humor) took pity on, giving him a second chance at love because he deserved it. Cris struck so many chords and echoed the exact same sentiments achingly familiar to many of us. Maybe in varying degrees and in different situations, but the emotions and the never ending questions are the same. Far be it from me for thinking wishfully, but I sincerely, truly pray that this book can be a personified version of Emilio/Nathan to all the Cris-like people out there. That by reading this, anyone contemplating to jump over the ledge in a moment of utter despair will be stopped and given a new ray of hope - hope that life is still worth living and that if we just KEEP ON, happiness may just be waiting around the corner. Thank you, Celestine Trinidad, for giving me this opportunity to read Ghost of a Feeling’s ARC in exchange for an honest review. I’d previously done a live-tweet thread as I first read GOAF in full last November 1st. It’s mostly just me screeching incoherently and forgetting to tweet, but I did make a few observations of my own on some aspects apart from the main story itself. For sure, I have definitely enjoyed reading Ghost of a Feeling, and though I may have added more (unnecessary) layers to it than I should have, I daresay it is part of the fun of reading. It is that good. I would recommend this for people going through emotional issues and people who have friends and family who are struggling with depression. Cris, the main character was very relatable. She embodies th I would recommend this for people going through emotional issues and people who have friends and family who are struggling with depression. Cris, the main character was very relatable. She embodies those who struggled through tough situations and want to break free from it. I love the plot twist that is in this story and imagining it inside my head was like playing a movie with a great advocacy of educating readers about how it feels to have depression and how talking and listening truly helps. Hope. This book made me feel that I should not be afraid of this four letter word. I love how Celestine Trinidad tackled a very difficult subject and how she stayed real and raw about it. There were so many moments in Cris’ life that resonated so hard to me that I couldn’t help but tear up. I love how Nathan t Ray of light. Thank you so much for this book. Thank you thank you Celestine. I just finished this book last night. It's my first #romanceclass book and it didn't disappoint. I, too, have my own share of mental health issues and I can totally relate to Cris. I also like how realistic the portrayal is. I can only wish that I have my own Nathan to help me throughout my ordeals but it was very helpful that he was not written as a "Savior." He urged Cris to get help and not to be dependent on him. I also liked that Cris had discovered her own support system with her friends a I just finished this book last night. It's my first #romanceclass book and it didn't disappoint. I, too, have my own share of mental health issues and I can totally relate to Cris. I also like how realistic the portrayal is. I also liked that Cris had discovered her own support system with her friends and family and was not solely focused on Nathan. "With mentions of failure, bullying and suicide (not to mention, a great pretender~) on the blurb, readers might think twice adding Ghost of a Feeling to their reading list. I know I did. Because if you’ve experienced these things yourself, it’s a little scary to be going into a story that could possibly mess with your head big-time." Continue reading our review here. Please note: We don't use ratings but for this purpose, we tag books with three stars by default. Would like to be a reviewer/contr "With mentions of failure, bullying and suicide (not to mention, a great pretender~) on the blurb, readers might think twice adding Ghost of a Feeling to their reading list. I know I did. Because if you’ve experienced these things yourself, it’s a little scary to be going into a story that could possibly mess with your head big-time." Continue reading our review here. Would like to be a reviewer/contributor to Bookbed? Sign up here! This will definitely be a part in my favourite books list! I think all millennials should get their hands on this book! I am into books of these genre but this one stood out because of the "ghost" factor. A strong, well-built main character whose story will definitely capture the heart of readers. I loved how the characters first interacted and how they developed in the course of time. There was never a dull part. I love the style of writing and will surely checkout other books written by the aut This will definitely be a part in my favourite books list! I think all millennials should get their hands on this book! I love the style of writing and will surely checkout other books written by the author. I do not normally get a printed version of a book, but I do sometimes for books that I would like to remember (and re-read) in the future - and this book is one of them! And also, the cover rocks! I got an ARC of this book in exchange for a review. Ghost of a Feeling isn’t like the usual books that I have read from the #romanceclass community. It was surprisingly refreshing and well written considering that it was a book that included “ghosts”, suicide and the medical field. Honestly, I had a difficult time in writing this review. I didn’t really know what to say as I was in awe of how Celestine managed to write the story beautifully. But what I'm trying to say is, this book is highly recom I got an ARC of this book in exchange for a review. But what I'm trying to say is, this book is highly recommended! I don't normally feel this much for books and fictional characters, but when I do, I become so attached to them there's no turning back. And all I want is to express how much I love them and how much I appreciate meeting them. Ghost of a Feeling is a powerful story of moving forward by remembering what makes you feel alive. It's a story that will st I don't normally feel this much for books and fictional characters, but when I do, I become so attached to them there's no turning back. And all I want is to express how much I love them and how much I appreciate meeting them. Ghost of a Feeling is a powerful story of moving forward by remembering what makes you feel alive. It's a story that will stay in my heart, and it deserves all the love it can get. I've known Celestine Trinidad's brand of magical writing in the many speculative fiction anthologies she's part of. Her stories were the ones that have always stood out and became memorable to me that she's become one of my auto-buy / auto-read authors in the genre. Her first foray into romance was sort of an exciting thing for me as a fan of her work. But let me tell you nothing...and I mean NOTHING braced me for what was to come when I started reading Ghost of a Feeling. While the story dealt w I've known Celestine Trinidad's brand of magical writing in the many speculative fiction anthologies she's part of. Her stories were the ones that have always stood out and became memorable to me that she's become one of my auto-buy / auto-read authors in the genre. Her first foray into romance was sort of an exciting thing for me as a fan of her work. But let me tell you nothing...and I mean NOTHING braced me for what was to come when I started reading Ghost of a Feeling. While the story dealt with mental health issues, bullying, and suicide, there's more to Ghost of a Feeling than just that. There was also authenticity and raw emotions that characterized the major players of the book. It was easy to get into the story to the point that you'd feel like you were in the pages right beside the characters. One of the things that endeared this book to me was how everything felt natural and so relatable right down to the very emotions the characters felt. At some point in our lives we've traversed that same path of inadequacy, of letting people down, and of not feeling enough. There was so much raw emotion in this story that made me feel like I'm reliving every scene and feeling the characters were also going through. I'm not going to wax poetic about how evenly paced and captivating the story and characters were (because they were sooo on point), but rather I couldn't help but have so much feelings that I'd lost count on how many times I've cried while reading. The author had such a unique way of weaving a tale and at the same time cleaving you open with emotions so course, you'd become a sordid mess of feels. That's not a bad thing, really. I for one love it when a story makes me feel things versus going through the motions of flipping the pages until I finish and count it as another notch on my Goodreads Reading Challenge. Ghost of a Feeling did not just make me cry—it also made me realize that, just like Cris, I was not alone in whatever struggles I had. It's a rare thing for a book to make me feel that way and I'm grateful that it did. I was also glad the author didn't force the romance into the narrative. Everything was well thought of that you kind of have this feeling that someone cares for you in a way that doesn't force ideals or standards down your throat. This is my new favorite book. Just wow... No words could truly explain how I feel about the book. I love it that Cris takes me to her journey. I know it was never easy to go through emotional turmoil and you can't tell it to anyone because of the fear that they'll judge you for it. Kudos to the author for this awesome author. A dark yet sweet story about what leads to thoughts of suicide and how reaching out for help can help.